provide skin with the proven whitening efficacy of mulberry extracts (Morus alba root extracts) that are rich in Vitamins B3 and C to help visibly brighten skin. The cleanser dispenses a fragrant and astonishingly silky ball of foam I love putting on my face. I use four pumps of the product to properly clean my face and it does the job. That is, if I do not put on foundation or bb cream. Otherwise, I use the Neutrogena Brightening Mulberry Ultra Foam cleanser as a follow-up to my Shu Uemura cleansing oil routine. I have been alternating the cleanser with a salicylic facial wash for almost 2 months now and it never caused me to break out (compared to the Revitalizing Pink Grapefruit variant). It is consistently non-drying and does not leave my face uncomfortably taut. Perhaps a more frequent usage or another bottle of this Neutrogena cleanser will do permanent wonders. Morus alba extracts are known to function as natural skin bleaching agents making it a little difficult to discount the possibility that this cleanser can improve skin clarity over time. Recommendation. If you're on the hunt for a mild cleanser that's tough on non-makeup dirt and impurities, this is a good product. I strongly feel that those with less problematic skin (acne-free) will find this a good cleansing staple. Plus, there's a bonus of ending up with a brighter complexion after each wash, too! Disclaimer: Product was sent to me for review purposes. 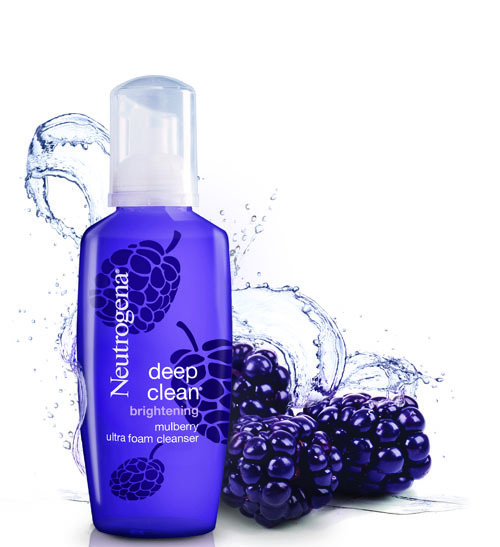 Post content is in accordance with my personal experience while using the Neutrogena Deep Clean Brightening Mulberry Ultra Foam Cleanser.